B. Love Family Festival celebrates young families. 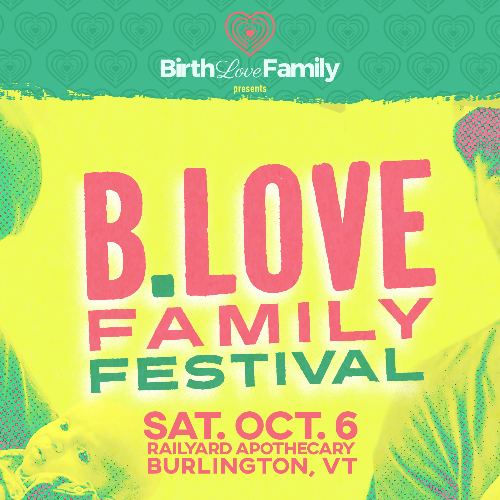 Live music with Myra Flynn, CBD & Herbs for Raising VT Families panel discussion, birth/family education, yoga + massage, bounce house, face painting, storytelling! Dynamic kids activities! Vendors, swag bags, door prizes and more!! B. Love Family Festival with Myra Flynn celebrates young Vermont families. Panel discussion and workshops led by local birth and family experts. Dynamic kids activities. Yoga, massage, live music, bounce house, art, face painting, and storytelling! Vendors, swag bags, door prizes and more!!! Thanks to our sponsors: SunCommon, Elmore Mountain Therapeutics, Oils 2 Go, All Wellness, Stone Leaf Tea, and Phoenix Physical Therapy. 1pm - 2:15pm CBD & Herbs for Raising VT Families: A Panel Discussion with Dr. Sarah Wylie, N.D., Midwife; Jessilyn Dolan, R.N., C.D., CBE; #CannaMom Ashley Reynolds, owner Elmore Mountain Therapeutics; and Joanna Vinton, Herbalist & Midwife Apprentice. 3:40pm - 4:20pm Birth and Postpartum Choices with Rachel Stadfeld, C.D.